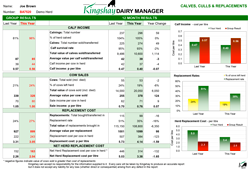 Detailed Performance & Management reports including herd longevity & replacement rates. More details of the Regular Package reports are shown below with examples. Also includes an example of the Input Form showing typical data required. 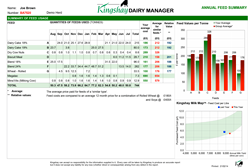 Forecast production and monitor your progress month by month. 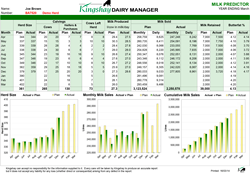 A monthly report comparing milk production against forecasted figures. 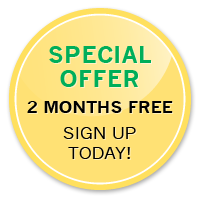 We can produce a milk prediction for your herd based on future calvings. Compare your costs of purchased feeds to other herds in your region. 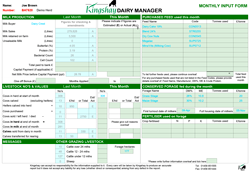 Are you paying too much for your purchased feeds? 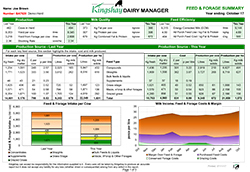 An annual report analysing & comparing feeds fed in the last 12 months. 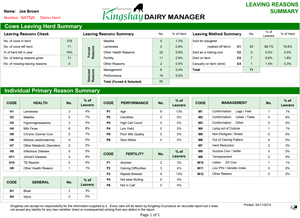 A 12 month summary of data entered on reasons for cows leaving the herd. A comprehensive analysis of Feed & Forage Utilisation and Costs over the last 12 months, including an estimate of grazing intakes (if applicable). 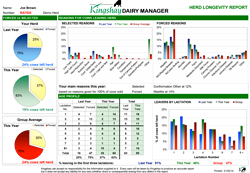 A quarterly report with details of Margin over Feed & Forage, with comparisons month on month and year on year. An example of the data required to complete the Regular package.